Back in October 2009, I pulled this book at random off a shelf at the library, and boy, am I glad I did. It is the story of a woman, Carolyn Jessop, born into a polygamist community in Utah. She became the fourth wife of a man more than thirty years her senior when she was eighteen. (Over the course of his life, her husband had more than a hundred children by fifteen different wives.) Her husband mistreated all of his wives, to the point of slavery and extreme domestic violence, but these women still strived for his affection, even though they knew they didn't love him. They also challenged each other and did not stick together. Life was miserable for Carolyn in this religion; in extreme sects of FDLS (Fundamentalist Church of Jesus Christ of Latter-Day Saints), women have absolutely no rights or freedom. The climax of the book is where she plans and executes her escape with her children from the FDLS sect and her husband. In order to properly be separated, she must cross the state lines into non-FDLS territory. Her children, particularly the older ones proved to be the hardest obstacle in her escape. Some felt torn loyalty between her and their father and were not eager to leave their community. The part that scares me the most is the fact that this is happening in modern day...not five hundred years ago like it sounds like it would. She went on to become one of the few women who ever challenged her husband and religion, and the first to successfully leave the community with all of her children. The compound was later raided by police in 2008. This book is full of encouragement and knowledge for those like me who were completely ignorant about FLDS and polygamy. The writing style is not the best, but was very thought-provoking nonetheless. And also that it was in the US. There is so much protest over women's rights and freedoms under fundamentalist religious laws in other countries that we often fail to see - or to admit - that there are also abuses committed against women by fundamentalist religious sects within our own borders. I read this book a little over a year ago, and I was floored. I love the HBO show Big Love, but was in no way prepared to look inside how horrible a situation things were for Carolyn. This book made me cry, and made me very, very frustrated (as do almost all religious fundamentalist groups, especially ones out to disenfranchise women). You can check my full thoughts in my review, but I just wanted to say that I agree with everything you wrote, and hope that this book impacted you as much as it did me! I want to read this book! I can't imagine the inner strength she must have had in order to even dream of getting away from her husband. 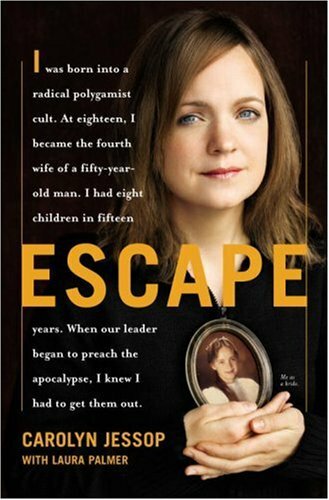 I read this a few years back, and it actually got me started on a modern-day polygamy FLDS reading trip. I'm fascinated and horrified by the topic. I read this book over the summer for a course I took in Kinship and Family Systems, and also reviewed it on my blog! I got so excited when I saw that someone outside the class had read it, haha. I felt so proud for her when I reached the end of the book, since it was her courage and testimony that played such a huge part in Warren Jeffs being convicted. This seems like it would be a really interesting book ... definitely will look for on my next trip to the library! Interesting. I'm really interested in books about polygamy, and I read this one two years ago when it came out. It wasn't my favorite, but brought up some interesting issues nonetheless. I like polygamy books that paint a little bit more of a complex picture - I want to get into these peoples heads and understand why they do the things they do. This book just portrayed them as bad, evil people.